Tunable XFP transceiver and tunable SFP+ transceiver are the hot-swap DWDM Tunable optics used in 10Gbps SONET/SDH, Fibre Channel and Gigabit Ethernet applications. Tunable DWDM transceiver is a unique device which allows customers to set the channel that the laser emits. Generally, the tunable optics is for C-Band 50GHz, starting from channel 16 up to 61 (depends on the manufacturer of the Router/Switch and which channels it supports). This article will shed light on the revolutionary Tunable DWDM transceivers. The introduction of these new optical components enable telecom, datacom, and enterprises operating a DWDM network to significantly reduce their sparing costs, improve their operational efficiencies, and turn up new customers or circuits in a fraction of the time it would normally take. 10G DWDM tunable SFP+ transceiver is compliant to SFP+ MSA. This flexible transceiver can be tuned to any one of C-band channels with 50GHz spacing, supporting data rate of 10 Gbit/s-11.3 Gbit/s. DWDM tunable SFP+ transceiver operates over LC singlemode fiber for a max linking length of 80km. Tunable XFP can be tuned from channel 1561.83 to 1530.33. This tunable optic has a reach of around 80km depending on the fiber quality and the mux type. The Cisco version is the “ONS-XC-10G-C” and there are more brands like Juniper, Ciena, Extreme and Brocade which are offering these optics. Typically, a DWDM network is set up with fixed wavelength DWDM transceivers. The laser hardware inside a DWDM optics has a fixed wavelength for transmitting over a DWDM channel. That means if one channel fails, you need this specific channel device in your spare part stock. A DWDM network can be used with 40 channels, so you need to stock 40 fixed wavelength DWDM modules. However, with Tunable SFP+ or XFP modules, you have the possibility to reduce OPEX or be flexible in terms of spare parts and stock. To build a well-organized DWDM networks, you are supposed to scale up a wavelength planning for ordering the right types. There needs to be a documentation which specific channel is already in use at different locations. By the use of Tunable module, you just need to count the unused DWDM ports instead of each wavelengths and order the needed amount of only this one product. This reduces a lot of complexity and makes the planning so much easier. Tunable transceivers renown as spare-optics, provide the flexibility to customers and reduce the amount of spare optics you need r to hold in stock. Owing to the special tunable laser in tunable optics, they are between two and four times more expensive than the regular static DWDM optics. The following figure shows the cost comparison between DWDM SFP+ and Tunable SFP+ optics from FS.COM and Flexoptics. In fact, the Tunable XFP/SFP+ can be tuned in different ways. It is such a new technology that currently, most high-end devices make it possible to tune over the command line interface, but not every switch or router is capable of this. For example the ASR9000 and the MX80 can be used for this but the EX4200 series from Juniper does not support this, which is indeed the biggest challenge in the tuning of these optics. Metro Ethernet network mainly consists of IP nodes, e.g. switches and routers interconnected by numbers of 10G interfaces. Network installers usually implement DWDM connectivity by using colored WDM transceivers in 10G ports and directly connect to dark fiber to line through passive optical multiplexer. According to the above description, only few of the IP node (optical switches and routers) support tuning wavelength of CLI commands. And as for Optical Transport Networks (OTN), it is focusing on carrying payload and multiplexing, switching and supervising networks in optical Layer 1 domain. But how about tunable optical transceivers in OTN network..? Still, the mainstream is conventional fixed wavelength DWDM transceivers. This compact device allows end-users to self-select any DWDM channel for each tunable SFP+ transceiver, tune it, and set it as a fixed-channel DWDM optic on demand. The whole DWDM sparing costs can be substantially reduced through the use of Tunable optics. Therefore, it would be popular in the near future. 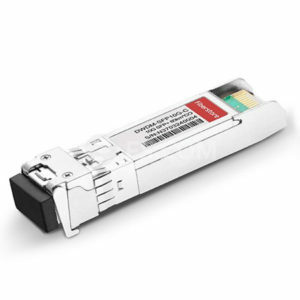 In fiber optical networks where fixed DWDM channel XFP/SFP+ transceivers are currently used, changing to Tunable XFP/SFP+ transceivers offers the potential for large inventory stock reduction since all wavelengths can now be covered with one transceiver module. Tunable module will make itself a desirable choice to replace the fixed wavelength used in many networks.